I’m a planner. I can hear my husband laughing as he considers this an understatement. Over two months ago, I began planning out what needed to be done to be as prepared as possible for our move north next month. This planning included service to all vehicles, making reservations for stops along the way, etc. Implementation of this plan began immediately. For example, I made all of our reservations for stops in July during the first full week of April. Sometimes things just do not go according to plan, and that is a risk one has to take if one wants to plan ahead. I’d still rather plan for the big things than to wing everything. Here is a story of planning that did not go according to plan. Jim and I knew that our tires would need to be replaced before moving as they were original to the RV and over 6 years old. 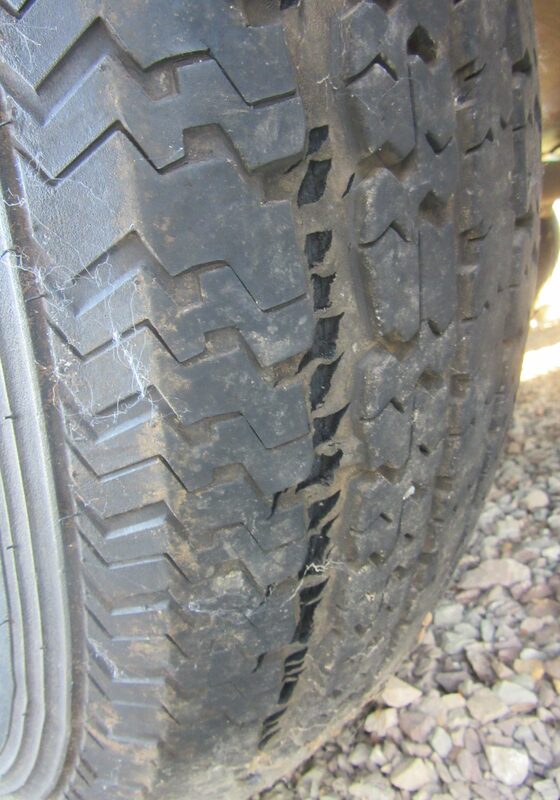 We’d done what we are supposed to do to protect the tires: checking air pressure before moving, staying at or below the speed limit for the tires, etc. When parked, we keep the tires covered to protect against UV rays. When we moved to our 3rd site in this park almost a year ago, our tires were okay, but replacement was a must due to age. 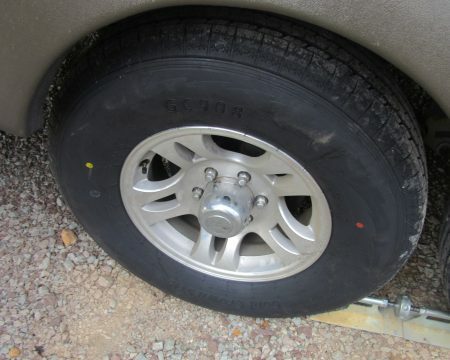 Almost 3 weeks ago, we priced tires at several local tire stores after having “shopped” online for good rated trailer tires that would fit our trailer and were within our budget. We leaned toward Carlisle radials. When we asked for trailer tires in our size made in the U.S., a man at one tire store told us that Carlisle is the only one in the size for our camper made in America. Since pricing was exactly the same, we actually chose our tire store based on the vibes we got when there and the ease of getting the trailer to the store and back to the campground. Tires were ordered on June 3rd, and we were told the tires normally get in within a day or two. On June 13th, I called to confirm the tires we wanted would be in when we brought the 5th wheel to them Friday afternoon, June 17th. This was confirmed. Friday morning, bright and early before it was too hot, Jim and I were taking covers off the tires, checking air pressure, and prepping the camper to move that afternoon. After removing one cover, I was shocked to see what appeared to be a line of holes in the tread the tire. I called Jim to come see, and we both stared in shock. The other tires were checked, but none of the them had this. We had a spare but no way to lift the 5th Wheel to change it. Neither of us felt comfortable in driving the trailer with a tire like that in the heat of the afternoon, even though we only had 6-miles trip. While Jim and the tow truck driver were chatting, I got the dog out, brought in the slides, and continued to prepare the camper to move. Then, Jim came over to me and said, “We have a problem.” You see, dispatch had told the driver it was a motor home, so he didn’t have the adapter to tow a 5th wheel. He and Jim finally decided on a plan as we had to get the camper in that afternoon. Towed with wheels down, if the tire was going to blow, it was going to blow whether Jim was driving or the other guy. They decided to use our truck to tow it the six miles, and the big truck would follow with flashers on. He could block traffic, so Jim could drive very slowly. If something happened, the guy would be behind Jim to help.With the camper hooked to our Dodge Ram, Jim pulled out with the tow truck behind. Chewie and I held back, cooling ourselves in the campground office, while they made the slow trek to the tire store. I was too nervous to go right behind them anyway. When I did not see them broken down on the side of the road, I was relieved – even more so when I saw them safely parked in the tire store parking lot. We were 15 minutes late for our appointment, so the folks took a couple of tire rotations in front of us. 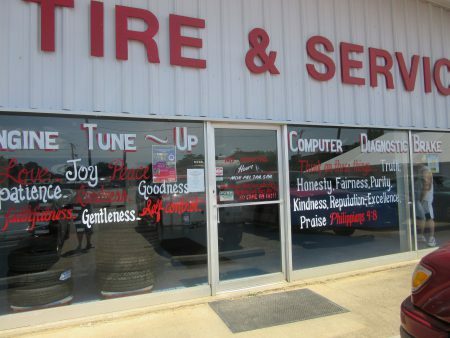 The tire store owner looked at the tire of concern, and he said the steel belt was pulling away. We had to wait 40 minutes, but finally it was our turn to drive back to get the new shoes. While we waited, I told the gentleman working the counter that we failed to order a replacement spare, but the day’s events made us remember. He said since they don’t stock the tires we had them order (again, confirmation of the tires that should be there) they’d have to order another one. That was fine. Relieved that all was well now, Jim, Chewie, and I went to Sonic for ice cream since we were so hot and ran a couple of other short errands. When we returned, our truck and camper were sitting out ready to go. We went in, chatted with the folks, made arrangements to get the spare tire changed and a truck alignment this week, and paid. When the owner told me the price, I said, “Are you sure that’s right?” I got no response, but as I said, everyone was enjoying a nice chat. Once in the car, I looked at the invoice. The amount was wrong. The tires were WRONG!. They had put the wrong tires on the camper! Rushing to stop Jim from pulling out, I took a quick glance at the tires – Gold Crown brand – definite China bombs. I caught him before he turned onto the highway, and we both went back to the office to tell them what happened. The guy was embarrassed; everyone in the office thought the tires ordered had come in, but then they realized they had not. What to do? He sent us back to the campground with the tires they put on and re-ordered 5 Carlisle tires. I guess he’ll have to sell these tires as used with 12 miles on them, but it was their error. Yesterday, the owner told me that four had arrived – enough to put on the camper – so we have an 8:00 a.m. appointment this Friday, June 24th. Hopefully, the 5th tire will arrive before this Friday, so we can be done with tire issues. Things could have been much worse in so many ways, but even though a bit of a challenge, if things go well Friday, all will end well. Sometimes “life happens” and things do not go according to plan. All five of the Carlisle tires arrived before today. Jim and I were up at 6:00 a.m. to get the camper ready to move again. We had additional incentive to get it done because a thunderstorm was on its way. All went well, save a battle between Jim and the electrical cord, but that’s a story for another time. We arrived at the tire store at 7:30, when they opened. Our appointment was for 8:00, and we were told that we might have to wait until the rain passed, since they’d be working on the camper outside. We understood that. Heck, we’d been told it would be a 1 to 2 hour job, and the wrong set was put on in about an hour. Jim, Chewie, and I went to find breakfast and ran a few errands. We arrived back at the tire store about 10:20, expecting the camper to be done (or nearly done) since the rain had stopped by about 8:30. Nope, it was not done. By about 11 a.m., we were checking out, when one of the guys realized they had not put the new Carlisle tire (for which we had just paid) on in place of the 6+ year-old spare. We were told it would only take a few minutes. While it did not take long to switch tires, remounting the new spare to the back bumper took almost an hour. The kid doing this job stripped the bolt, so eventually, the bolt had to be cut off and a new one obtained and installed. Jim with camper in tow finally arrived back at the campground around 12:15, just when the bright sun and dampness from the rain combined to make it really hot and steamy. 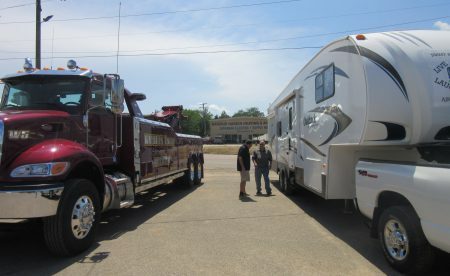 We had just enough time to get the camper parked as needed, leveled, and unhooked from the truck and then load the truck with things to take to Florence to get on the road road for a 2:00 p.m. meeting there. Let’s just say that this whole tire replacement thing was a stressful and time-consuming ordeal. I hope the tires last for a decent time and serve us well. I am so glad all turned out well.